The manufacture of coke by heating coal in absence of air has its origins at the start of industrial revolution when Abraham Darby used in the smelting of iron ores in 1709 in England. The method of coke production was initially the same as for the production of charcoal, stockpiling coal in round heaps, igniting the piles, and then covering sides with clay. This laid the foundation for beehive coke making. 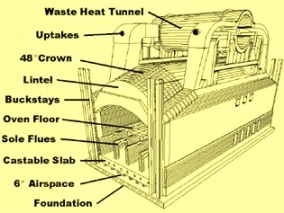 Gradual advances led to the development of beehive, reverberatory and byproducts ovens, culminating into regenerative coke ovens with recovery of the byproducts around a century ago. Non recovery coke ovens. When the heat energy of flue gases is recovered in the form of steam then these ovens are known as heat recovery coke ovens or energy recovery coke ovens. The first non recovery oven was built in Jewell in 1960s and the first non recovery coke plant with heat recovery was commissioned at Indiana USA in March 1998. The plant had 268 ovens with a capacity of 1.3 Mtpa and a heat recovery power plant rated at 100 MW. In the process of coke making in the non recovery ovens (Fig 1), volatiles evolved during coal carbonization are not recovered as byproducts but are combusted in the oven itself in the presence of controlled quantity of air and the heat of the volatiles of evolving gases is utilized for coking of the coal mass into coke and thus no external heating is required. The higher level of heat importantly is used to break up the potentially polluting hydrocarbons into the constituent combustible compounds and to burn them thus avoiding the potentially hazardous pollution. The heat consequent to combustion is only partially utilized during the process and the balance heat in the waste flue gas is recovered for energy generation. Non recovery ovens are of horizontal design and operate under negative pressure unlike byproducts ovens which operate under positive pressure. Primary combustion air, introduced through ports in the oven doors, partially burns directly the volatiles (Including tar and benzol) in the oven space above the coal. This generates the heat needed for the process. The mixture of the crude and the waste gases is led through the vertical ducts in the side walls to the heating flue system under the oven sole. Secondary air is introduced into the sole flues, which runs in the serpentine fashion under the coal bed and completes the combustion. The design of the flues and the control of the air flow allow the coking rate at the top and bottom of the coal bed to be equalized. Due to the temperatures generated, all the hydrocarbons and byproducts are incinerated within the oven. Coking time varies from 48 hrs to 72 hrs depending upon the design of the non recovery coke ovens. Hot gases pass in a waste tunnel to heat recovery steam generators (HRSG), where high pressure steam is produced which is generally utilized for power generation. Around 9 MW of power can be generated for 100,000 tpa coking capacity. The cooled flue gas is cleaned in a flue gas desulphurization plant prior to being discharged to the atmosphere. 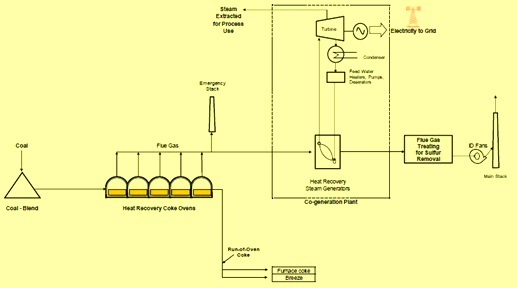 The flow process sheet of heat recovery coke plant is at Fig. 2. Non recovery coke ovens differ from byproducts ovens in many ways. A comparison between the two is given in Table 1. No waste water treatment plant is needed. No net waste water discharge. All the waste water is used in Coke quenching. Can change coal blends often and wide varieties of coals can be used. Elimination of wall pressure constraints increases the coal blend flexibility. Improved coke strength is attributed to slow heating at higher temperatures and longer soak time causing consistent crystal growth. Plant can be constructed with modular construction. Since non recovery ovens work under negative pressure, these results into ambient air being pulled into coke oven at any available intake point and thus eliminate any fugitive leaks. Hazardous air pollutants are destroyed in the oven by thermal oxidation. There are lesser numbers of process control points. Quite informative andsimpleto understand the pricess. Great sir.